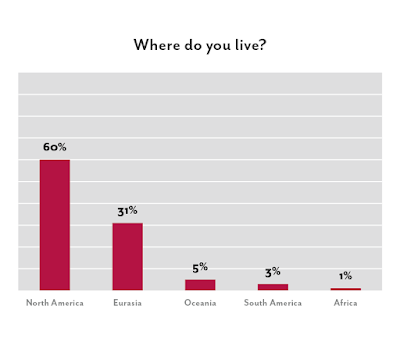 Naturally, as well as being a bit of a worstenfeest, there's a huge bias towards Americans of the United States variety, so much so that 'Eurasia' can comfortably be lumped into one bar on a chart, in spite of it encompassing a large majority of the world's population. I expect this is a result of the survey's limited reach (David may have a very handsome beard, but he is only one man), and suspect that large numbers of artists in Eastern Europe, China, India, and various East Asian countries have remained hidden from view. Tellingly, my home country comes (a very distant) second, and the Dutchies only manage four people (come on, Dutchies!). If only we could reach more into East Asia in particular, I think the picture might be quite different. The huge male-identifying bias is unsurprising, looking at the scene, but a little disappointing. More diversity would be very welcome, particularly for the fresh insight it can bring. Hopefully things will improve in this respect in the coming years, as the science of palaeontology itself becomes increasingly diverse. Demographics aside, there's a notable disparity between people who are aware of plagiarism (a huge majority) and those who are aware of having been plagiarised (a minority). This probably reflects the fact that it's largely only a few 'big names', the minority of people who become published pros, whose work is being plagiarised heavily. Still, plagiarism is clearly still a huge issue, and artists naturally don't look too kindly on it, with some 80% viewing it as 'ethically questionable'. "Another note, from film/video theme park world is that clients just want more Jurassic Park. The Jurassic World movie has emboldened the money men that accuracy really does not affect the bottom line and taking a chance is too risky. If it ain't broke don't fix it." This is one reason why it's frustrating that the JP/W is franchise is not gunning for more up-to-date dinosaurs; if it did, and still made the money that it did (and it definitely would), it would convince the Marketing Twonks that more accurate palaeoart is worth investing in. Strict accuracy wouldn't even be necessary, simply going beyond the 1980s level of the first movie. But I digress. I'm sure they all explained it in some half-hearted fashion in-universe, anyway, so that's OK.
On a more positive note, at least palaeoart appears to be on the up, even if it isn't paying especially well for most people. (David did tell me about one joker who reported improbably huge earnings, and was thus excluded from the results. It was probably John Sibbick, who I hear is finally being paid for all the times he was ripped off, and now lives in Osborne House and drives a Ferrari with the number plate 'SI88 ICK'. *) Commissions are mostly on the up, or staying about the same. No doubt this reflects the palaeontological boom we're living through. 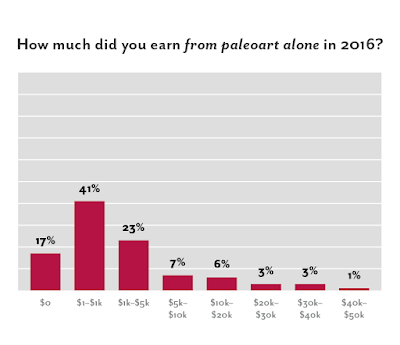 On the other hand, around half of palaeoartists aren't sure if palaeoart has a "sustainable and prosperous future" as an independent enterprise. "Paleoart is the face of earth history. The public's understanding of earth history, and science in general is central to their ability to make informed decisions about everyday things, from voting, to what products they consume, to how big they think life's problems are. Good paleoart can be an emotional hook and relatable entry point for the public into the world of observational natural sciences and science generally. Paleoart is also important because it helps scientists get funding for future work as it makes their work more accessible to people both within and outside their field." 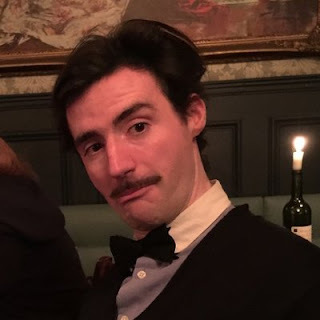 And let us not forget the very eloquent and succinct person who, when asked why they thought palaeoart was 'a worthwhile and valuable pursuit', responded: "duh". *This is definitely not true. 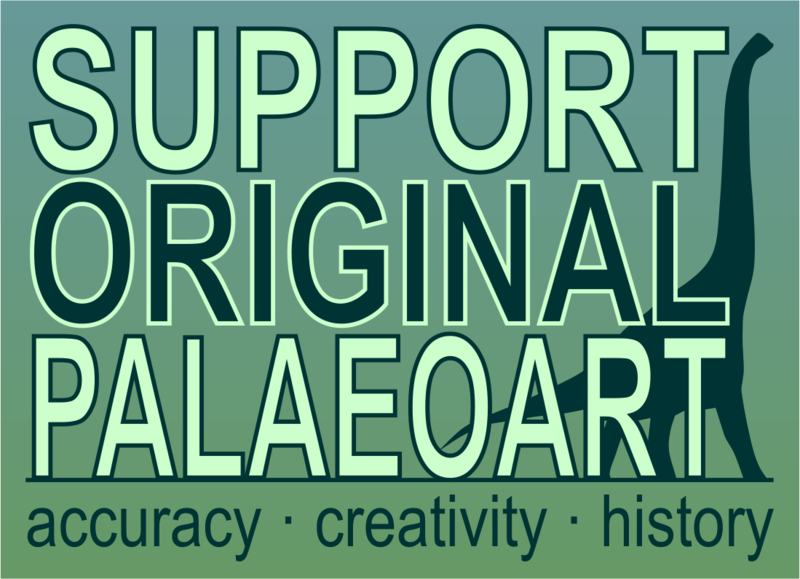 A little thought about the Paleoart Survey. I appreciate this very servey very much and hope that it will become more and more widespread over the years. Something that troubles me a little when looking at the results is that this is a survey for a art form evaluated by its own participants. So it is very self reflecting, a very inside perspective. That is great, don't get me wrong, but I imagine it could be interesting to have a little wider scope, with a second survey for researchers or other paleo enthusiasts. Making one for the public would be nonsensical right now, but getting a better picture of what the whole paleo-world thinks could be more fascinating. Do non-paleoartists see the same problems we see, do they appreciate Paleoart as much as we think? What paleoartists do they know, how much are they willing to pay for artwork? I know this would be really difficult to pull off, so these are in the moment just some musings that went through my brain so I write them down before I forget them again.